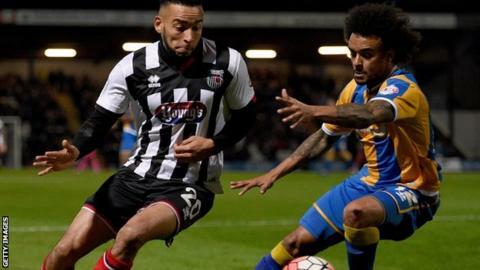 Grimsby eased to a derby win over 10-man Lincoln City. The Mariners took the lead when Omar Bogle's deep cross was headed home by striker partner Padraig Amond. Luke Waterfall was sent off before the break for bringing down Amond when he was running in on goal. The hosts dominated after the restart and Bogle hammered a 20-yard effort just over before Nathan Arnold made the points safe with a powerful shot that gave Imps keeper Paul Farman no chance. Lincoln are now without a win in their last six league matches while Grimsby have won all of their last six league games. "It's only three points but it's a nice three points. It's great to send that crowd home happy. Fantastic atmosphere, big build-up and we got the result I think we all wanted. "I thought the first half was scrappy overall. I thought we looked the more likely (to score). "The message at half-time was to start passing the ball to each other. I think when we did that, every time we passed the ball we created chances." Match ends, Grimsby Town 2, Lincoln City 0. Second Half ends, Grimsby Town 2, Lincoln City 0. Hand ball by Connor Robinson (Lincoln City). Substitution, Lincoln City. Chris Bush replaces Lee Beevers because of an injury. Attempt saved. Padraig Amond (Grimsby Town) right footed shot from outside the box is saved. Attempt missed. Connor Robinson (Lincoln City) right footed shot from the right side of the box misses to the right. Attempt missed. Padraig Amond (Grimsby Town) right footed shot from outside the box is too high. Goal! Grimsby Town 2, Lincoln City 0. Nathan Arnold (Grimsby Town) right footed shot from the right side of the box to the top right corner. Assisted by Padraig Amond. Attempt saved. Omar Bogle (Grimsby Town) right footed shot from the centre of the box is saved. Attempt saved. Jack Muldoon (Lincoln City) header from the left side of the six yard box is saved. Attempt missed. Omar Bogle (Grimsby Town) right footed shot from the centre of the box misses to the left. Attempt saved. Matt Rhead (Lincoln City) right footed shot from outside the box is saved. Hand ball by Craig Clay (Grimsby Town). Attempt missed. Matt Rhead (Lincoln City) header from the centre of the box misses to the right. Assisted by Terry Hawkridge. Greg Tempest (Lincoln City) wins a free kick.